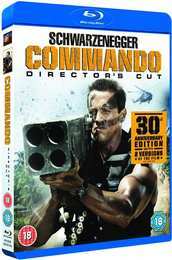 Now on Blu-ray; for the first time ever experience every awesome moment of Commando the way it was intended! In time for the 30th Anniversary this special edition Director's Cut includes amazing action, extensive special features and all the Arnold you could ask for. Retired Delta Force operative Colonel John Matrix (Arnold Schwarzenegger) lives a secluded life with his daughter (Alyssa Milano). When she is kidnapped by a brutal former team member seeking revenge Matrix must travel to South America and get her back. Somewhere... somehow... someone's going to pay!